A: If you purchase gold or silver within your existing IRA you will not take possession of the metal. It is stored at an insured, regulated depository in your name. Once you reach the age of 59 1/2 you may then take delivery without penalty. Possession can be accomplished in a SEP IRA contact us for details. A: Each application is unique and may vary. On average, the process is completed in two weeks. Using your existing IRA information, we generate the paperwork for your review, we can send you a PDF version via email or priority mail the IRA Docs. One you have decided to move forward simply sign and date the highlighted areas and send the documents back in the pre-paid Federal Express package and the account will be opened. 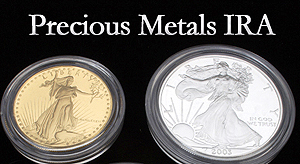 U.S. Gold, Silver, and Platinum America Eagles coins, as well as certain other bullion coins, bars and Proofs that meet IRS requirements. More Questions? Call (877) 703-2193 Toll Free. We will answer any questions you may have.